Marketing Essentials™ is for businesses that want to improve their sales & marketing scope and effectiveness and want to learn and become proficient—through hands on experience and weekly guidance from experts—in the marketing tactics that work best for their business. It is a comprehensive, easy-to-adopt solution that first develops a marketing plan, then improves your marketing and technology “assets” and finally provides the ongoing, active assistance your business needs to cost effectively grow its leads, sales and brand. Our assistance with benchmarking and program management. Control their expenses through all-inclusive, fixed fees. 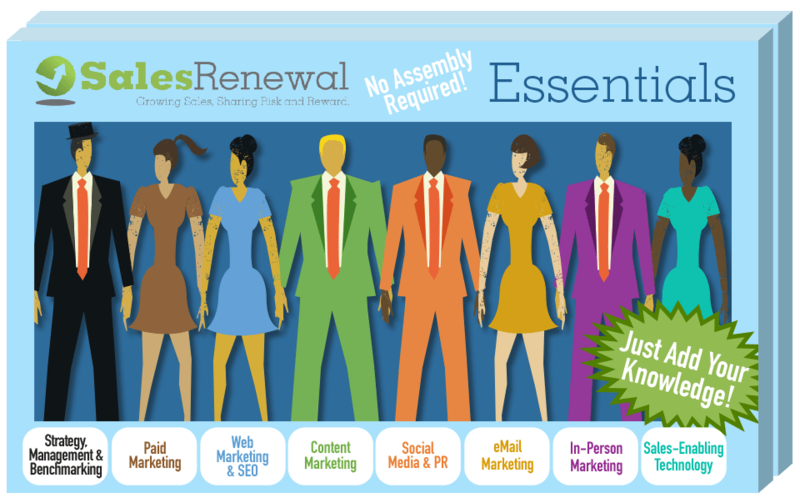 Marketing Essentials’ fixed monthly fee includes: fees for Sales Renewal, its subcontractors and included tech tools. The only costs not included are the monthly ad spend and email provider & hosting vendor fees. The Marketing Essentials Solution begins with a 6-month trial program, although there is no obligation to continue past Month 1. Month 1: We collaboratively create your Marketing Essentials Blueprint: a strategic marketing plan that tailors the essential mix of marketing programs for your specific business. At the end of this month you will have a solid sense of the Marketing Essentials Solution and can choose to continue the trial or not (the vast majority of clients do). If you do discontinue, you will be able to take the good ideas in the Marketing Essentials Blueprint with you. Months 2-3: Sales Renewal makes the changes, improvements and additions to your marketing and technology called for in your Blueprint. Months 4, 5 & 6: In weekly Coaching sessions Sales Renewal will guide you as you implement the Marketing Essentials by sharing our experience and expertise with you, teaching you best practices, accelerating you through learning curves, and being a knowledgeable sounding board for the unanticipated issues that always arise. Sales Renewal will also provide SEO and online advertising services through subcontracted experts that we manage on your behalf. We also coordinate your Networking Coaching and assist you with benchmarking and program management. 1. Self-Service: You take your newfound expertise and marketing in-house and we part friends. 2. Flex Marketing: You continue working with Sales Renewal through Flex Marketing, our coaching/doing program. 3. Marketing Essentials: You continue with the Marketing Essentials Solution™ as it continues to grow your leads and sales. 4. JointSourcing: You upgrade to the custom, powerful JointSourcing Solution™ that shares risks and rewards as it accelerates your growth. How Much Does Marketing Essentials Cost? Marketing Essentials is a traditional fee-for-service program, where you pay a set fee each month during its six-month term. Many companies like this approach because, on day one, they know what their total cost will be. Visit our Marketing Essentials – What’s Included page for pricing information.